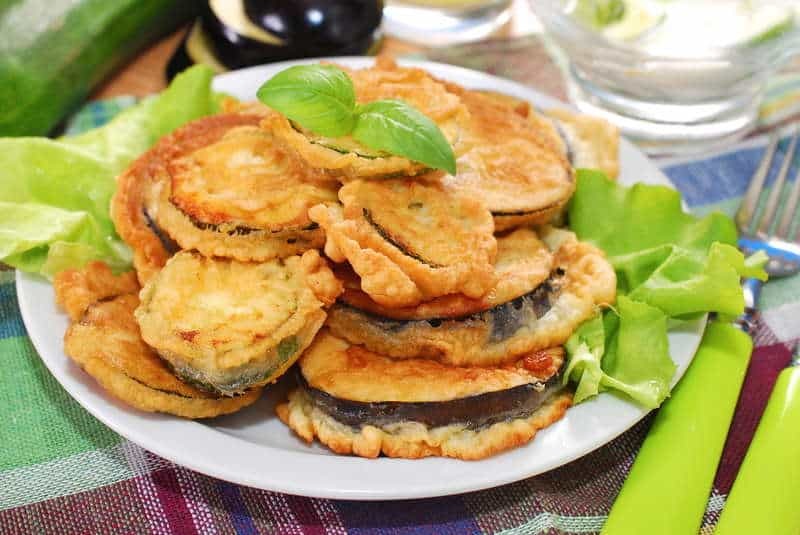 Silky, sweet eggplant coated with batter and deep fried to form an amazing, golden brown, extra crispy crust! A delicious Greek fried eggplant recipe that you just can’t miss out! Eggplant is a favourite ingredient in the Mediterranean diet, that is used in many popular Greek recipes. Whether simply baked, topped with some salty feta cheese or used in more complicated dishes like moussaka or ‘melitzanes papoutsakia‘, eggplant is with no doubt a Greek summer favorite. Fried eggplant is probably one of the cooking methods that seems to put people off the most because of how much grease the eggplant can soak up. If you ever tried preparing fried eggplant before then it’s highly likely that you have faced the disappointment of a greasy mushy dish, that despite all efforts didn’t cook properly. Here are some tips I’ve learned from experience that will help you succeed on your very first attempt! In order for your fried eggplant to cook thoroughly, try slicing in equal sizes, not to thin or too thick. Leaving the skin on will help it form a nice crust around them and create a nice contrast in texture. The extremely spongy texture of eggplants can result in it absorbing too much oil and result in a heavy dish. However there is a simple way to overcome this. Salting, also known as purging, is an essential step for this Greek fried eggplant recipe as it accomplishes two goals: salt pulls out water and other juices that carry bitter flavours, thus removes the bitterness and prevents the aubergine from absorbing too much oil and getting greasy. Drying the eggplants thoroughly before frying is as important. Squeezing out excess moisture will give you a less greasy result. The perfect eggplant is made of a crisp exterior and tender, silky, light interior. To achieve the perfect result, fry the eggplants in a single layer in plenty of oil that just covers the eggplants. Not overcrowding the pan is vital for a delicious crispy batter to form! Layer the eggplants sparsely in the pan, without sticking one to another. If you add too many, the temperature of the oil will decrease, resulting in your fried eggplants not cooking thoroughly. Keeping the oil hot will crisp up the outside while retaining the aubergine’s texture. Heat the oil to medium-high heat, just before it starts smoking. To check the oil temperature, test it using a small diced eggplant. If the oil begins to sizzle around it, creating small bubbles then you are ready to go. Turn the eggplants often in the pan and adjust the heat to avoid burning until they have a formed a rich golden brown crust. Prepare this delicious Greek fried eggplant recipe for your friends and family and serve as part of a meze platter with some tzatziki sauce and you have a match made in heaven! To prepare this Greek fried eggplant recipe, start by preparing the eggplant. Wash the eggplant thoroughly, remove the stalks and ends and slice in slices (approx. 0.5-0.7cm) or lengthwise. Place the eggplant in a colander and salt generously. Set aside to drain for 30-60 minutes. Rinse with plenty of water, squeeze to get rid of the excessive water and pat them dry. Leave aside to dry completely. In the meantime, prepare the batter for the fried eggplant. Pour the beer in a large bowl and add the flour (sifted) a little bit at a time whilst whisking, being careful not to get lumpy. The batter should be liquid but firm enough to use for coating. So if it’s getting too firm, use less flour than this recipe calls for. Season with salt and pepper, cover the batter with some plastic wrap and place in the fridge for 30 minutes. Dip the eggplant one at a time in batter and fry in plenty of hot oil on both sides until nicely coloured, for about 1-2 minutes. Remove the fried eggplant using a slotted spoon and place on some paper towel to dry. Repeat with the rest. Serve this delicious batter fried eggplant while sill hot. Enjoy!